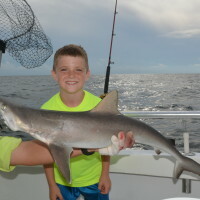 Although uncommon during the early part of the year, Blackfin Tuna, Sailfish, Tarpon and White Marlin come in close to shore during late August and September. 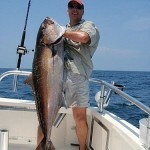 This Blackfin Tuna weighed 20 pounds and was caught the other afternoon while slow trolling some 6 miles south of Orange Beach on the Distraction Charter Boat. 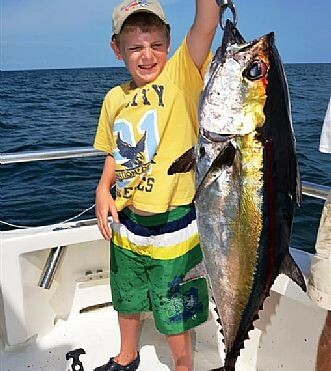 Even though we are trolling for Spanish Mackerel and King Mackerel, sometimes when we pull baits through a school of Bonito, some Tuna are mixed in with them, feeding on the squid that are just beneath the surface. 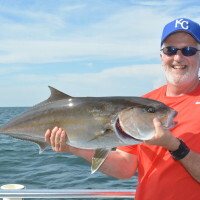 The fall of the year is an ideal time to go trolling near shore, but most of the time we are trying to catch something good to eat. 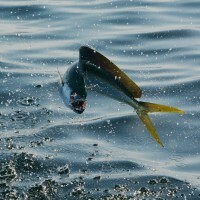 The Blackfin Tuna are simply a welcomed bonus fish for any angler.